Just Step, Snap, And Go!!! If you hate having to take your shoes off to indoors or inside the house and want to pop in and out of the house without having to untie, remove and re-tie, then this is shoe covers are just perfect for you. Simply step onto the Step-In Shoe Covers and continue striding without fear. It is the most convenient way to free your mind from thoughts of staining the floors from dirty shoes. These Hands-free reusable shoe covers are designed to fit all sizes. Made of a thin layer of vinyl on the bottom, can provide great traction for the user. Easy to set up and ideal for camping, backpacking, overnight trips, and many other outdoor activities. 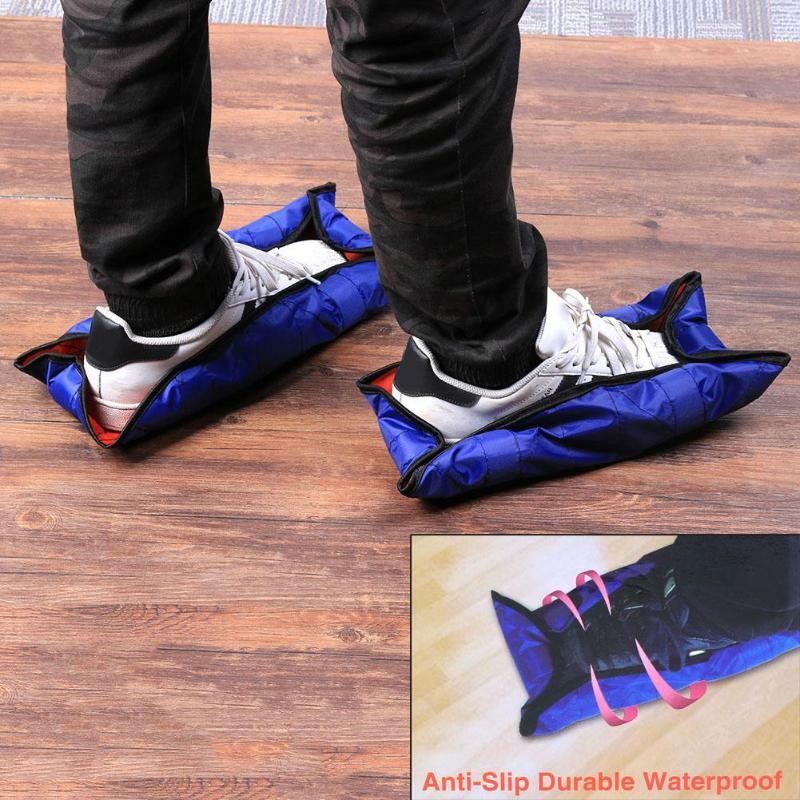 instantly covers the bottom of your shoes for walking around indoors while keeping the floors clean. Easy to use, on and off twice in 5 seconds, just set the shoe cover flat on a level surface, step on and the device will immediately wrap itself around the bottom of your shoes. can use them over and over again without having to create extra waste and plastic use. As advertised, use these for all of the workers tracking through the new house. Seemed to save the newly finished wood floors from the boot damage. perfect. exactly what i needed for when workers enter my home etc and i want to protect my wood floors! These shoe covers are wonderful to provide to clients who are selling their home. We love them! They are strong enough to re-use if they don't get too dirty. The non-slip surface on the bottom is an extra bonus on these as compared to others that don't have it. These are pretty durable and helps guard against sliding. I work in a restaurant field and have to wear a surgical boot due to a broken foot. Without this bootie I wouldn’t be able to work as the floor is too slippery. These shoe covers are good quality and I rec'd on time. I keep these in my car and slip on before going to our barn... it's easier than putting on a different pair of shoes. When I'm done, I just toss them in the trash. They fit over shoes nicely and are a good quality so I don't feel they are going to rip. I'm using these for when people come over to view my house as it is for sale. These shoe covers are thicker than most and they are water resistant. I use them so I won't get my carpet dirty and I can reuse them several times because they're so durable. They don't RIP very easily and will fit all shoe sizes. Very good quality. They are sturdy! Unlike some others that are flimsy. Fast delivery and great product. Perfect for real estate.